Welcome to my 2nd Saturday Showcase! Today I am so excited to get to introduce you to my friend, Kristy Belton Bleau! We've been friends for about 14 years, although Facebook has made it much easier in the last couple of years to talk more often. She recently moved back to California (from Texas!) with her daughter, and I am so happy that I get to actually see them now! That's not the reason why you need to know Kristy, though. You need to know her because Kristy is doing some really cool things working with two really great organizations. Kristy: We basically set up in a parking lot in downtown Santa Ana and offer the community a warm meal. We also gather local job postings and community event postings. Once a month, or so, we do a clothing distribution for those in need. The people we help are some of the most grateful and amazing people I know. They thank me every week for going to serve, not knowing that they are making a bigger difference in my life than I am in theirs. My goal is to show them that even though they are feeling worthless and low, people DO care. 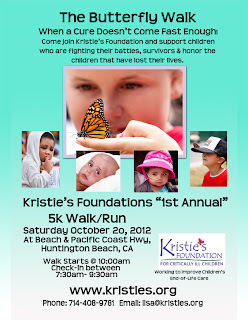 The other organization that Kristy works with is called Kristie's Foundation. In fact, she's going to be doing a 5k walk today to support this amazing program. 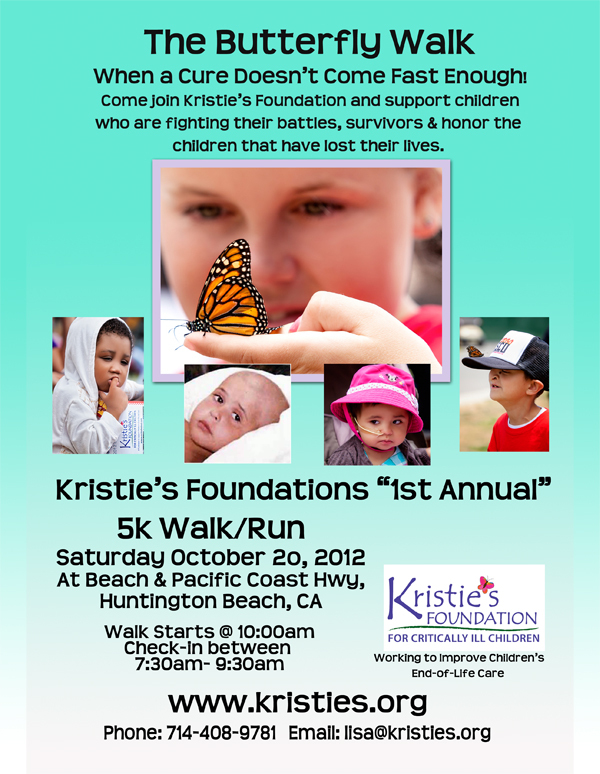 Kristy: It was founded by a mom that lost her daughter Kristie at age 7 from leukemia. In the process of watching her daughter pass away, Laurie saw there was a huge need for end-of-life care for children. That is why she started Kristie's Foundation. We work with families that have critical and terminal illnesses. We do hospital visits, offer emergency financial assistance, and offer resources for people nationwide in regards to end-of-life care. We help the kids that most people try not to think about until they are directly affected. Hospice has been a passion of mine since I helped take care of my grandfather for 6 months before his death in 2009. I held his had for 48 hours until he passed. That was when I really understood the transition to death. It was the most amazing experience I have ever had and I knew that God was there with us. I am such a believer in hospice and what they do for both the patients and the families... Many people don't understand hospice... so I have made it a goal to help bring awareness to hospice. I love volunteering and going to sit with hospice patients and listening to their stories. I am also huge on cancer awareness... especially childhood cancer. I have networked with people all over the country that have kiddos fighting childhood cancer. The strength these kids have is amazing. Kristy and I have been talking for a couple of months about things that I can do to help her with this work. As some of you know, I went through my own battle with a critical illness about 7 years ago, so these organizations really speak to the place my heart is in. I have been the recipient of generosity and love from strangers. I am excited that I'm cancer free and now I can be on the other side of the giving. Kristie's Foundation uses a butterfly in its logo, and so I made a batch of butterflies (the ones in the pictures, there were about 15) for Kristy to take to the kids that she visits in the hospital, and the kids that she'll be seeing tomorrow at the outreach breakfast. It didn't take very much time, and it was fun to work on something small while I waited for Mims to get out of school last week, but Kristy was overwhelmed when she saw them. She told me that even though it seemed like such a small thing, it was going to mean so much to the kids that she works with. So, here's what I'm doing, Dynamos. I've decided to do more. I'm going to pick one pattern a month to make for Kristy and the charities she works with. I'll donate as many as I can make, and I'm going to act as a hub if any of YOU want to participate. Kristy and I are partnering up on this, and I love that I can use crochet to help make the world a better place. 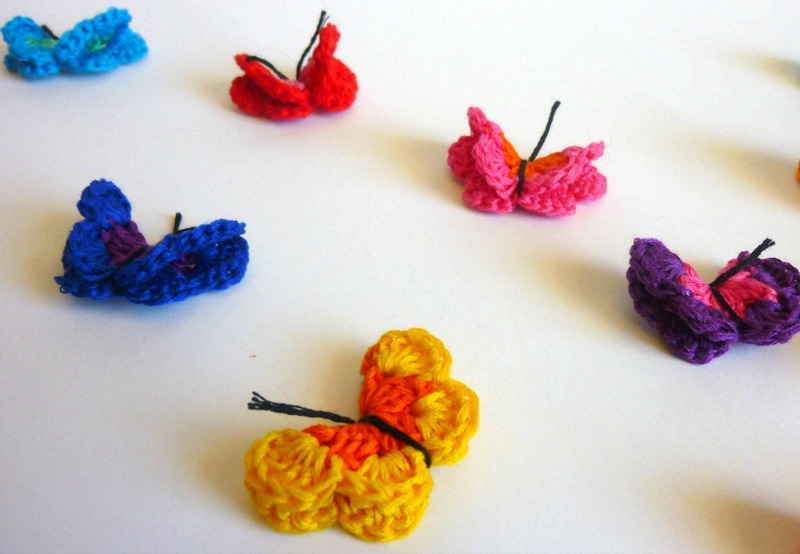 I know that some of my Dynamos crochet just to keep busy, so if you would like to work on something that would be really meaningful to someone in crisis, then please consider joining me as part of this project. update 10/21/12: There is no need to add a backing pin or bobby pin to the butterflies before you mail them. Thanks! I'll be squeezing out some butterflies for you in the hopes it will let people know that we care. Wish I could do more. Wow, thanks Teeni! I really appreciate it! How wonderful. I will have to jump in this project some day. My baby octo pattern works up fast, feel free to use it sometime. Thanks Nyan! Oh my gosh, that would be perfect! Absolutely I will let you know, Carol! Thank you so much!! what a terrific idea! I've done some charity crocheting over the years and it's a lovely feeling to be able to do something you enjoy knowing that it will help someone else feel better about life. Always reminds me of the women who knitted socks for soldiers during WW's I & II. I agree! ♥Piper♥ actually put the idea in my head a few months ago, and then when I realized what Kristy was doing, I just had to make this happen. It's weird and awesome how things work out that way sometimes. 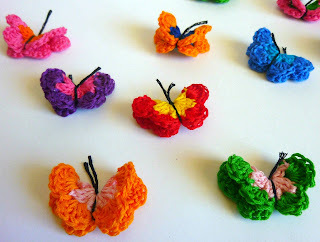 I have a question, are you backing/finishing the butterflies with anything? You pattern shows them finished with bobby pins but it doesn't look like anything was attached to the ones for charity. I would love to make some and send to send to you. Please let me know if there needs to be a pin or something on the back. Hi Edith! What a wonderful question. I should have said said something about that! Thank you for bringing it to my attention. I'll fix it in the post. No, you don't need to add anything to the back. I will do that when they arrive, so that it can be used for whatever Kristy's kids need. This is great! I have so many made already. Your pattern and another, I love yours. I love butterflies, my mom use to tell me they are made of smiles... and of course I know it is true because when you see one it always brings a smile. 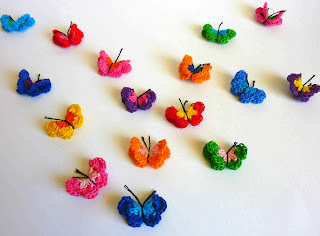 I kept thinking what am I going to do with all these butterflies??? This is the best answer ever. Thank you! A beautiful "flock" is on the way. They are wonderful just hanging anywhere! Hi Kathy! You are awesome! Thank you so much! And I totally agree, you can't look at a butterfly and not be happy! First let me say thank you for "spot lighting" me. I don't think what I do is a big deal...but I truly love it and I have met amazing people that have changed my life. I have been brought to tears more than once during my work with the homeless and motel families as they talk to me and just appreciate an ear to listen and for someone to treat them like a person that matters. Anyways, the butterflies were and are a huge hit! The bright colors bring such a smile to the kids faces. I am going to email you as well... not sure when you will have more, but I know there are some sweet sweet girls on Sunday morning that will love some! Thank you to Jaime and thank you to all of you that want to help bring more smiles to the world! I am so glad to hear it!!! I'll get you some more for next Sunday. Can't wait to hear more about it! Um, Kristy, what you do is a big deal. A really big deal. So is Jaime helping you. You're lovely people. Thank you Karen. I really appreciate your kind words. I have met so many amazing people with amazing stories. Many that have just hit rough times. They just want to be treated and respected like everyone else. They are people I would have never taken the time to get to know before. Jaime is super duper awesome for taking on this project of helping me... and so are all of you!!! Fantastic! So glad to see a great partnership forming. Keep up the great work, BOTH of you! Thanks ♥ETF♥! Give S a hug from Mims and me! I'm in! I'm involved with many nonprofits in my area and know the challenges they face on a daily basis. Every little bit helps. I'm coordinating a crochet 'flash mob' for next week and am trying to get a whole bunch of people (knitters are welcome) to meet at our local hospital and crochet (knit) chemo caps. I know you're using a specific pattern, so if you'd be willing to shoot it over to me in an email, I'd love to make a couple for your group! Chemo caps are a project very near and dear to my heart!